This little table was my best thrift shop find last week. It's not an antique. It has a tag, "made in China", on the bottom, but it is all wood. 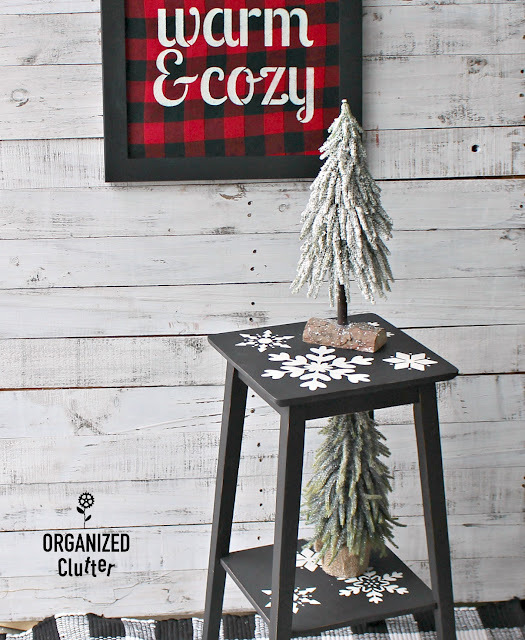 I think I could use a winter/Christmas table! 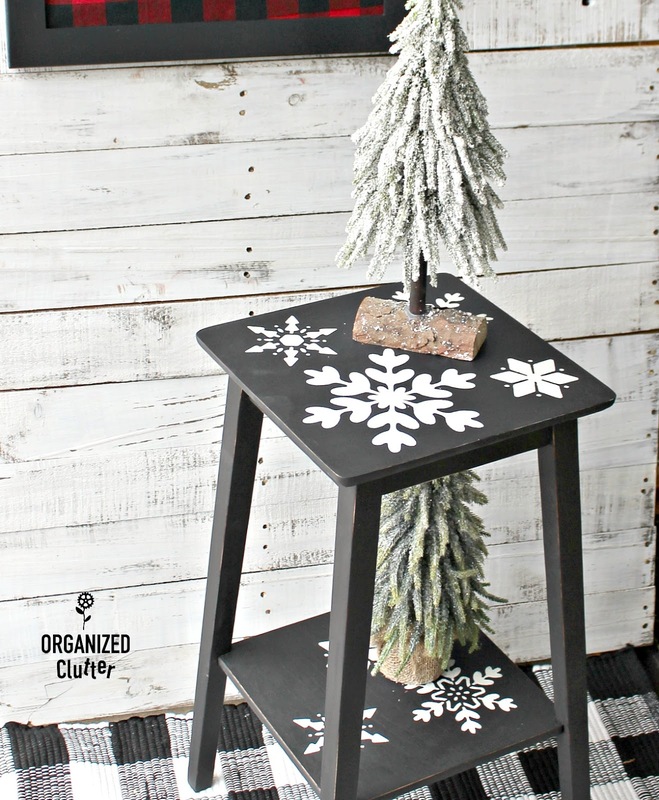 I used Dixie Belle Chalk Paint in Caviar (a very rich black) to paint my side table. The Dixie Belle Paint company's website has a lot of great information on how to use it's products. I have referred to it many times. I used the Zibra PB100LZS Grip-n-Glide 1-Inch Square Paint Brush for the very first time today. It made painting the legs a breeze, and it leaves almost NO brush marks. After I had brushed on two coats of Dixie Belle Paint in Caviar, I lightly sanded the edges with 220 grit sandpaper. This paper snowflake stencil was the one I used a couple weeks ago on my rustic fence board winter wall hooks project. The paper snowflake stencil is part of the FolkArt Holiday Value Stencil Pack that I have used on several projects in the past. 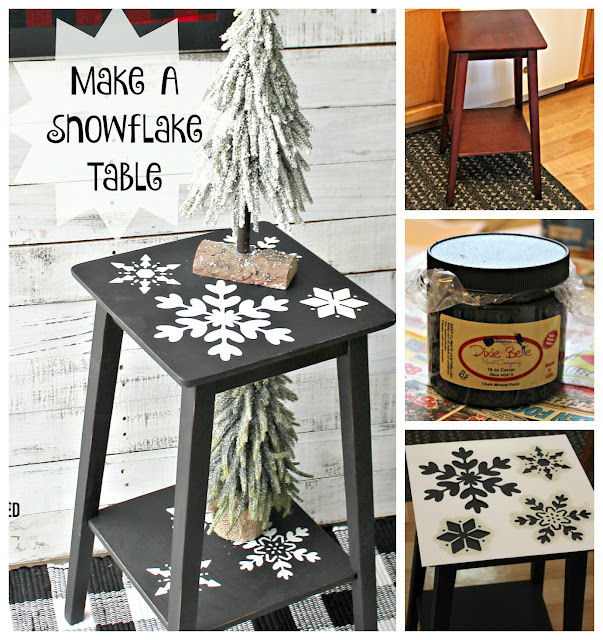 I used Dixie Belle Paint in Drop Cloth to stencil on my snowflakes. I sealed the stencils and brought out the rich hue of Caviar, using Dixie Belle Paint Best Dang Wax in Clear . I applied it with a clean, lint free rag. The table is perfect for tabletop trees or maybe even a poinsettia. 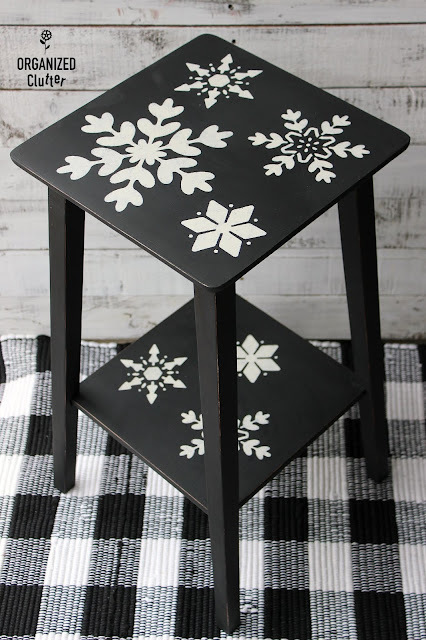 The snowflake theme can be carried on throughout the winter, especially here in Minnesota. *Dixie Belle Paint Company provided me with complimentary paint samples. All opinions about these fabulous paints are my own. I hope you can find a little table at the thrift shop to make your own snowflake table. I made the "Warm & Cozy" framed sign on buffalo check flannel using this thrift shop frame. 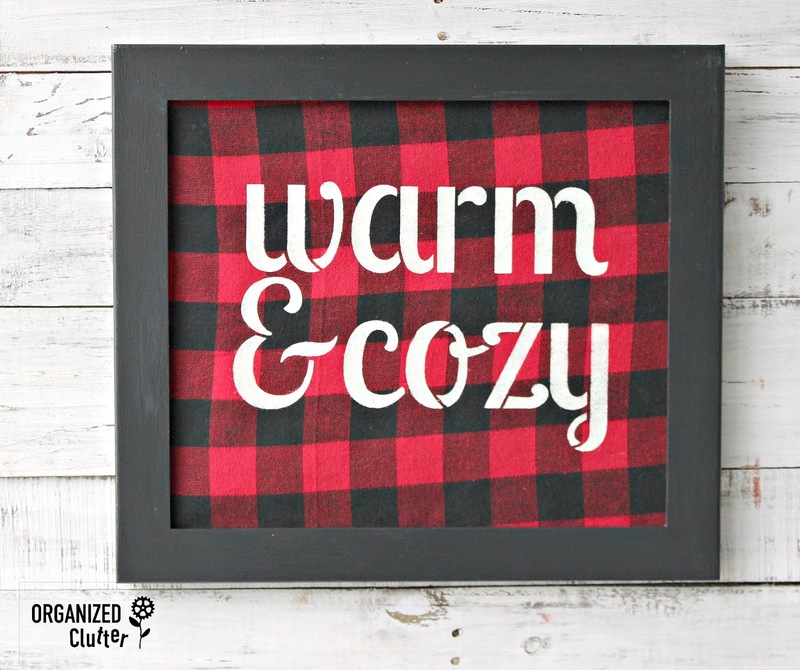 My red and black buffalo check fabric is from Joann Fabrics. I traced around the glass onto HeatnBond Lite Iron-On Adhesive . I then ironed the heat and bond onto my flannel fabric, and cut out the rectangle. I like to use Heat N Bond to add some body to my fabric, and it takes out ALL of the wrinkles. I didn't even remove the backing. I just stuck it in the frame. I am a perfectionist but I did NOT get the flannel lined up perfectly before I ironed it onto my fabric. I thought about redoing it, but I am so busy right now! My stencil is a new Folkart paper stencil pack called "Sign Making". It is only available at Plaid's website. I stenciled the flannel with Fusion Mineral Paint in Champlain, and I painted my frame in black. I have both pieces of glass behind my flannel fabric for the photos, as the glass adds too much glare. I like this sign, but wish I had gotten the fabric straight! OMG I love this!! 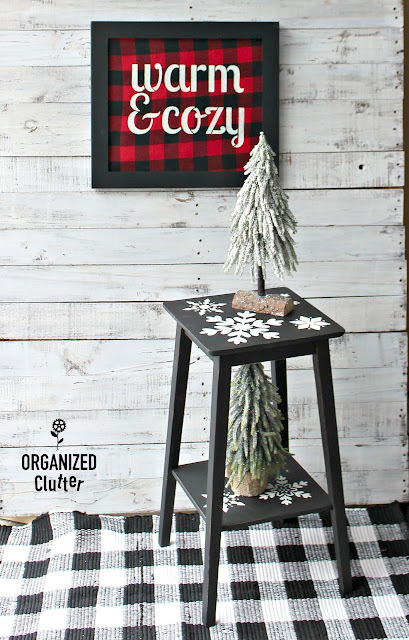 What a great way to repurpose it!